Colin Mochrie (center) and his four disciples, circa 35 A.D.
Colin Frederick Alistair Mochrie a.k.a "The Greatest Guy Ever" was born 50 years ago. Perhaps best known as the pilot of the plastic plane in Neil Cicierega's classic animutation, "Wondo Gumondo", he is actually the Son of God. God sent Colin down to this earth around Leeds. To "Bring laughter to thy people." Colin originally had long, blond hair, a huge beard, and no comedic qualities, but a handy knack for time travel. His father is Robert Duvall. He is believed to have been born some time in November, which would make him older than his brother, Jesus Christ. Mochrie worked as a shepherd, a carpenter, a butcher, a baker, a candlestick maker, a pirate, a poet, a pawn, and a king, before pursuing comedy. For those without comedic tastes, the self-proclaimed experts at Wikipedia think they have an article about Colin Mochrie. Colin Mochrie started out as a jester in King Arthur's court by the time he was 30, telling jokes, imitating plays, singing songs, and improvising, ad nauseam. Unfortunately, the King grew tired of Mochrie's antics, and he was burned at the stake in 36 A.D. at the age of 36. God then decided to give Colin a complete makeover in time for his resurrection. He became a bald, Canadian, goofy man who would win the hearts of millions with his improv comedy. The Second Coming of Colin Mochrie occurred on November 30, 1957, somewhere in Scotland. It is still unknown whether he came back as a baby or as a bald, goofy looking adult. But what is known is that Mochrie moved to Canada and continued his work in comedy and eventually joined such comedy troupes as the Second City, Groundlings, and finally wound up on a British TV show hosted by This Guy, called Whose Line Is It Anyway. 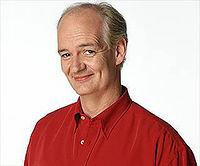 Colin Mochrie, the most funniest man dead, in a 2006 photo. The original British version of Whose Line Is It Anyway made its debut on Channel 4 in 1989 and featured many improvisational comedians: Colin Mochrie, Ryan Stiles, Wayne Brady, that guy from Cheers, John Cleese, Kenan and Kel, Greg Proops, Josh Server, Adolf Hitler, Bald and neckless, Winston Churchill, and Chip Esten. The programme was originally going to be entitled "Is This My Line?" after a famous Oscar Wilde quote, but the show's Producers worried that it could turn into a widely abused meme. Mochrie honed his skills on this program, providing such classic characters as Captain Obvious, Captain Hair, Craig T. Nelson, and Gabe Kaplan. He won the 1991 Nobel Peace Prize for his humor and was knighted by fellow Canadian Paul Shaffer in 1996. Unfortunately, Ryan Stiles did not satisfy the Queen, and the show was canceled in 1998, just in time for American comedian Drew Carey to watch the show and fight for his right to revive the show, albeit without most of the British Humour. In 1998, Drew Carey invited all of the guys from the British Whose Line who were actually funny to act on his American version, which debuted in August of that year to record ratings for an improv comedy game show starring Drew Carey and a bald guy named Colin. In fact, it's the only improv comedy game show starring Drew Carey and a bald guy named Colin in the history of television itself. Mochrie reprised Captain Obvious and Captain Hair and his infamous Craig T. Nelson impersonation. Colin is noted for kissing Ryan Stiles on the mouth many times and once almost falling off a six inch high step. This incarnation of Whose Line lasted for six years, 1998 to 2004. You can still catch reruns on BBC and America's BBC ABC Family. Whether either version of the show is actually funny is subjective. I, for example, find either version knee-slappin' hilarious, but you may think it's as stupid as Seasons 7-10 of All That or the 1980-1981 season of Saturday Night Live. Mochrie got engaged to fellow comedian Ryan Stiles on April Fools' Day 2005. It is unclear whether or not they have set a date for their wedding yet. Colin Mochrie still continues to "bring horror to thy people," even appearing as a tutu-wearing fairy in some beer commercial. He is plotting to reunite the cast of Monty Python by bringing Graham Chapman back from the dead. He also rules Canada with an Iron fist and will crush any disobedience under the jack boot of oppression. LONG LIVE COLIN MOCHRIE THE BALD GUY! This page was last edited on 27 February 2012, at 22:17.